Featuring: Hedwig's Theme / Obliviate / Ministry of Magic / At the Burrow / Dobby / Detonators / Farewell to Dobby / The Elder Wand. Composed by Alexandre Desplat (1961-). Arranged by Jerry Brubaker. Concert Band; Performance Music Ensemble; Single Titles. Pop Concert Band. Form: Medley. Halloween; Movie. Part(s); Score. 260 pages. Alfred Music #00-35403. Published by Alfred Music (AP.35403). True to the Alexandre Desplat's energy-packed film score, Jerry Brubaker has scored Suite from Harry Potter and the Deathly Hallows, Part 1 at the concert band level for the discriminating high school band. 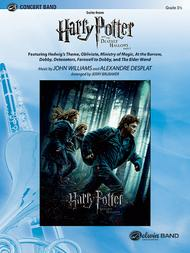 With so many charming tunes, the medley includes "Hedwig's Theme," "Obliviate," "Ministry of Magic," "At the Burrow," "Dobby," "Detonators," "Farewell to Dobby," and closes with a dynamic impact featuring "The Elder Wand." This medley will bring down the house!